I’m fresh back from Minneapolis to discuss what went down at the GP this weekend. Many trends are starting to pop up in the vendor world when it comes to card prices, and as usual I will be reviewing each vendor! As a note, my camera card was corrupted halfway through the event, so some vendor pictures may be old from previous floor reports. I had tweeted out before the event that I was building Ogre boxes. Quite a few of my followers had no clue what an ogre box is. Without stealing too much from Douglas Johnson’s article, it’s pretty simple to explain. This process was started by another St. Louis local known as Ogre in the vendor community, and can lead to way more money for only a little bit more work. An ogre box is where you take all of the cards that retail for under $5 or so, and look up the highest buylist for each card and place it in the corresponding stack. You then take the stacks and put them in boxes labeled clearly with how much you are looking to get for each section of the box. Vendors pick through them, and it saves you both time as well as getting the most bang for your buck. In my experience, smaller shops will take quite a bit as opposed to a shop like CoolStuff who has predetermined numbers that they are paying on everything even before the event halls open. Remember to take your boxes around to each vendor before compromising and going lower on cards before each booth has had a look! Remember, we make money off of players being lazy. Don’t be lazy, and you’ll make more money if you put in more work! Without further ado, let’s get into the nitty gritty vendor review system. 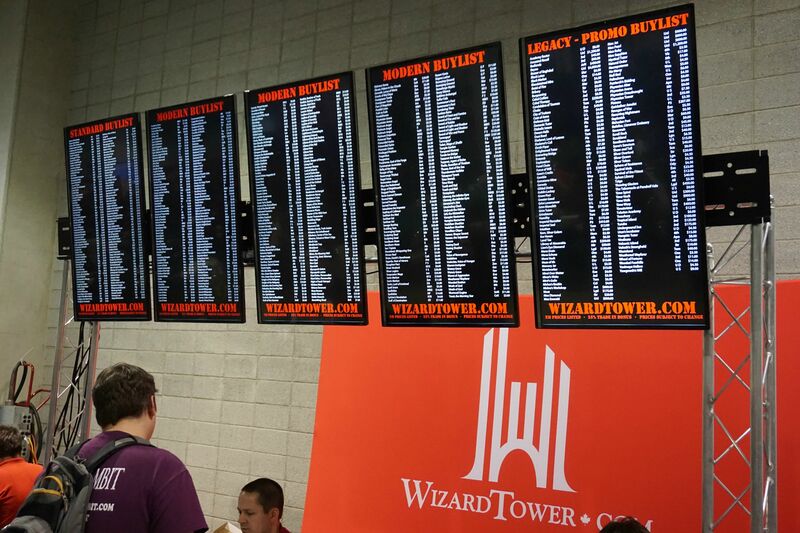 Power Nine was situated towards the middle of the room with MTGDeals when one walked through the doors first. As a result, they accumulated quite a long line of bystanders checking out their prices between rounds and a ton of foot traffic. I wasn’t happy with their prices on the higher end stuff, but their buyers were friendly. Ogre was buying for them and bought all of my Portal Three Kingdoms stuff at the highest buylist numbers I showed him off of MTGPrice’s own collection tracker. They also were paying the highest on Promo Stoneforge Mystics in the room at $12. An interesting situation occurred when someone brought in a pile of cards on a dolly, and sat at Power Nine for 2 straight days. To the untrained eye, it appears that this collection would be a goldmine. However, this meant that one of Power’s buyers would be encumbered with only buying and pricing this collection and haggling with this individual for the entire GP. Because it isn’t cheap to fly and house a buyer, it would have probably been more efficient to pay the seller to fly to Power’s shop and sell them cards after the GP. This is because if all the buyers are busy, people waiting to sell cards will simply go to another booth to sell their cards about 75% of the time, meaning that the shop will lose the opportunity to buy their cards in and make a profit. I myself walked away from Power the first day after a 45 minute wait, as all of their buyers were busy, but did come back Saturday night and was happy with the prices they gave me on my remaining cards. 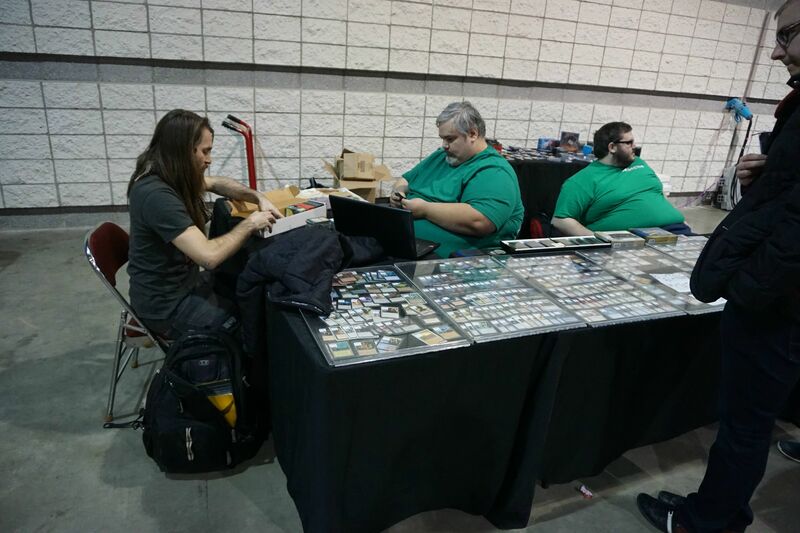 If you guys are selling cards to Power, I recommend selling to Ogre or Alex as they move very fast and don’t hem and haw over dimes and condition as much as the other buyers at the booth. 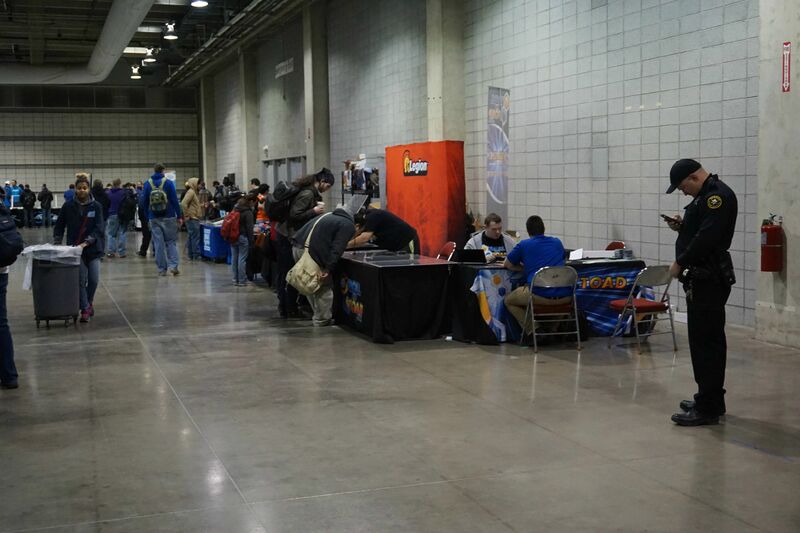 Tales of Adventure was a booth that I had previously contacted before the GP started about potentially getting an advanced buylist and selling Pokemon bulk to. For those that aren’t aware, Pokemon bulk can go for $100 a k in the right condition. I ended up selling played Pokémon bulk to Tales for 40 per k, an agreement both of us were happy with. I walked up to Tales with an Ogre box, and sat down with Jim and their President, Michael. I had previously talked to Michael about selling those cards and he had implied he would try and match mtg.gg numbers. I didn’t expect for Michael to buy 60% of my box at first glance however! They both worked on pulling apart the ogre box, and in a little less than an hour most of my first ogre box was demolished. I was very happy and had sold them a few things in my binder, when I received this message while still at the GP. http://imgur.com/Dt9zmFh . The fact that Michael reached out to me after I had sold a CE Chaos Orb to pay me more meant a lot to me, as he felt that he would have screwed me on the now $60 card (seriously guys? Too high of a price). Overall, I was very happy with Tales. Coolstuff has become a mainstay on the tournament circuit. I sat down with their buyers Victor and Ricky, and was happy with the numbers I received. Although Coolstuff doesn’t really haggle since they are a larger company, they do occasionally pay higher than others on random things that they are out of, such as Jhoira of the Ghitu and Gaddock Teeg. I didn’t sell them that much, but they always have consistent pricing and solid customer service at their GP booths. I ended up buying quite a few cards from their damaged binder, a practice few finance people look at when trying to get deals. I was able to get a MP scroll rack for $20, and also walked away with some free pens and life pads (now that’s value). 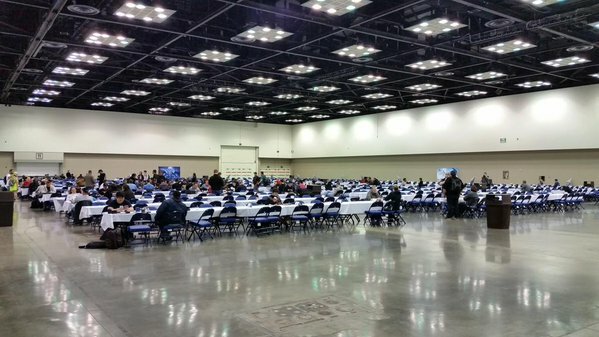 MTGCardMarket also had a central location right near the entry point of the hall. However, they didn’t seem that busy during the weekend. I didn’t sell anything to them, but I did scrape some fun deals from their damaged case such as a damaged Scroll Rack for 17 and a damaged beta Dark Ritual for 12. None of their buy prices really were high compared to the rest of the room, so I’m sad to see them on a decline from the last GP they vended. However, they did have a ton of high end magic cards in stock and quite a bit of graded power for those interested in trading for collection gems. Coming into this GP, I had never heard of this shop. These guys ended up being pleasantly surprising with both their prices and personality. Having your buyers wear moose antlers is pretty amusing and a gimmick that draws people to your booth. These guys had some of the best foreign priced cards on the floor, and solid buy prices. I didn’t sell that much to them, but I enjoyed the banter while waiting for them to look through my binders. Something that many vendors need to work on is their personalities and friendliness, and these guys crushed it. I hope to see them in the future, as this was a great booth that has so much potential in the future. This booth was situated closer to the back of the room, and one could tell by the amount of foot traffic that they weren’t really buying as much as their neighboring booths. However, Chimera showed up with the largest amount of sealed packs at the GP. A lot of players traded in and bought old packs for nostalgia, and I definitely pack war’d a couple too many with friends from their booth. Their buyers were friendly, but I didn’t end up selling anything to them. I did buy a played savannah from them later in the weekend, but for the most part I skipped this booth. Alter Reality brought some of the cheapest original Modern Masters packs on the floor to the GP. Besides that, I wasn’t happy at all. They were consistently 10-15% lower on almost all cards they picked through in my binders, and their staff wasn’t the most pleasant to deal with. This was a repeat of the last time I encountered them at SCGSTL, and none of my friends had a good time dealing with them in Minneapolis either. I hope to see a better booth at the next GP I attend, but I spent very little time and money dealing with them. 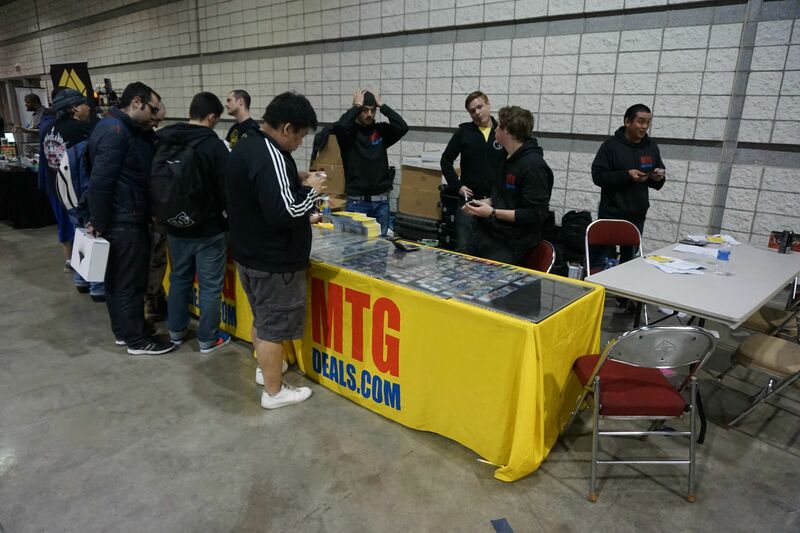 MTGDeals had some of the best buy prices and sell prices in the room, something they’ve become known for at almost every GP that they have vended over the last year. 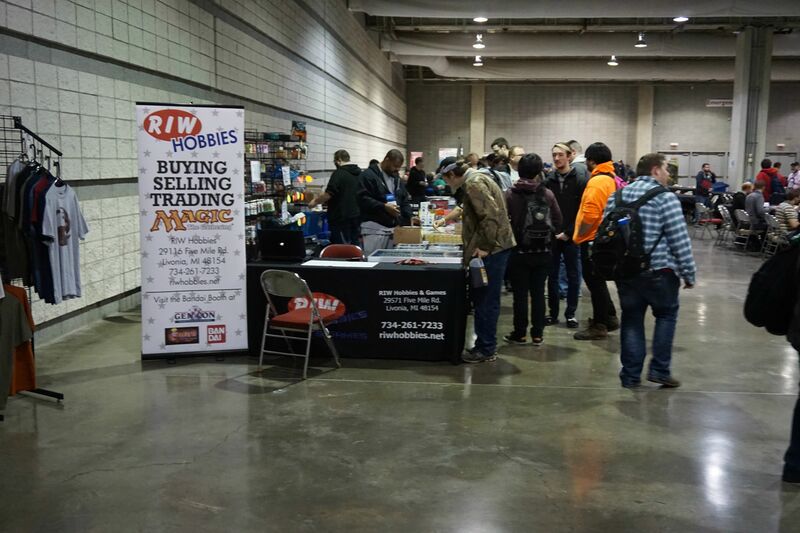 They had the highest buy prices on almost every staple in the room, and their booth was packed all weekend. Being near the doors, they had some of the highest foot traffic all weekend, and were packed for almost the entire weekend. I bought a lp savannah from them for 48, and sold them loads of Modern Masters cards that they were paying practically TCGLow on. They were also paying $90 on Lion’s Eye Diamonds, a sign that demand for this card is only going up as reserved list cards continue to provide good returns for those that invested or traded for them years ago. Hot Sauce had the third and final booth near the opening doors this weekend. They had great deals on played cards, but little was to be found when it came to their buy prices this weekend. After about 10 minutes of them looking through my binders, I walked away not satisfied with many of their prices they were offering when I could have walked a booth over to deals and gotten much more. In the past, I have been highly critical of Pink Bunny’s conduct at both events and shipping practices when it comes to them selling cards online. Pink Bunny had one of the strongest buylists this weekend on standard cards. They were paying $3 on most Battle for Zendikar dual lands, something that other vendors used to arbitrage their buys over for cards that they really wanted. Both Damien and Matt were highly friendly at this GP, and I found myself sticking by their booth and selling quite a bit to them. If Pink Bunny keeps this up, I will definitely look to make their booth one of the first stops at any GP Circuit. After talking with most vendors and floor traders, a clear picture emerged. Almost everyone on the floor was dumping Dragons and Origins rares out and trying to get low priced Eldrazi and blue chip cards in stock. After talking with a floor trader and reader of this site named Ryan, he echoed what many were thinking in the room. “Picking up Restoration Angels, Thoughtseizes and shocks seems like a good long term bet” according to him. A ton of vendors were also paying very low spreads on gods as they continue to soar in popularity. I still personally feel like the gods have quite a long way to go, especially the ones from Born and Journey (I just wish I hadn’t sold so many at their low to Ryan Bushard). 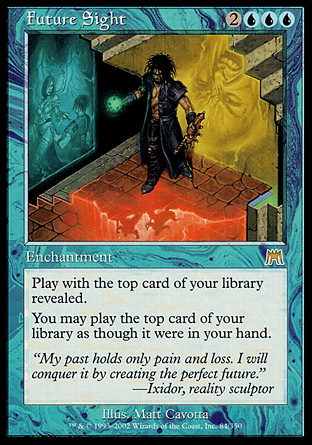 Other cards that were in heavy demand on the floor were Library of Alexandria, Chromatic Lanterns, and Rishadan Ports. Port had been confirmed as not in Eternal Masters during the first day of the event, so traders were trying to get every copy they could on the floor. 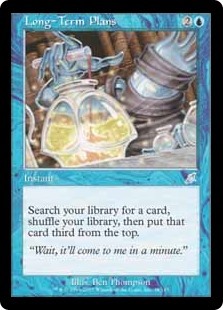 Chromatic Lantern continues to be a blue-chip card, as every multi colored EDH deck needs one of these and most players don’t care paying the ever increasing rate this artifact commands. Many players were trying to dump foreign foils, and I picked up a couple Russian Foils that were intentionally underpriced for my cube. 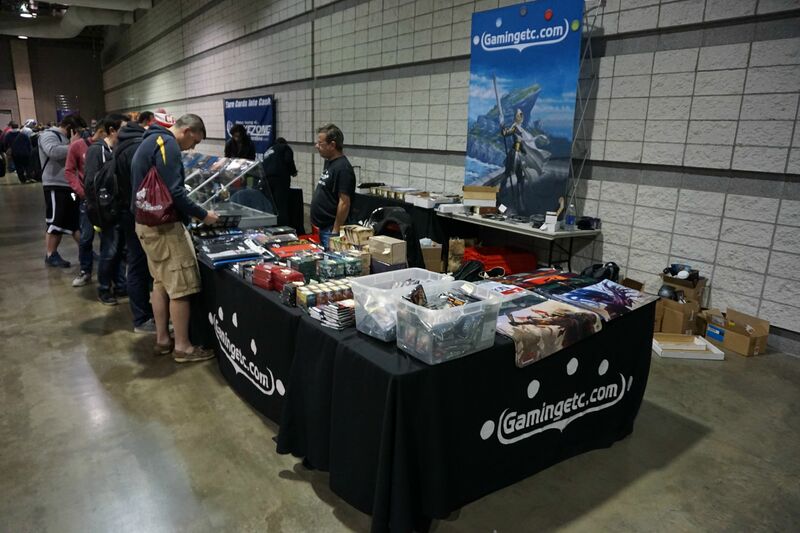 Pastimes did a very good job with this event, unlike previous disasters such as GP Chicago that I had attended. 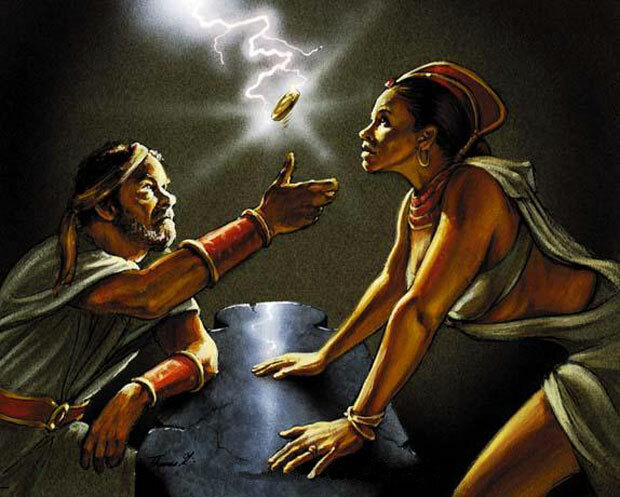 The Legacy event Friday had a mishap with the payout, and Alan the owner personally confronted each player about it and provided twice the amount of payout as well as a free $25 entry fee into another event this weekend. Rounds were quick, and side events were moving very well. Overall attendance for the GP was around 1500, with many pro players trying to grind last minute pro points to secure their Platinum status for next year. Overall, Minneapolis was a fun event and a great city. Feel free to leave feedback in the comments, or reach out to me @xemitsellsmagic on twitter. I hope each one of your Eternal Masters packs has a Jace! Hey guys! 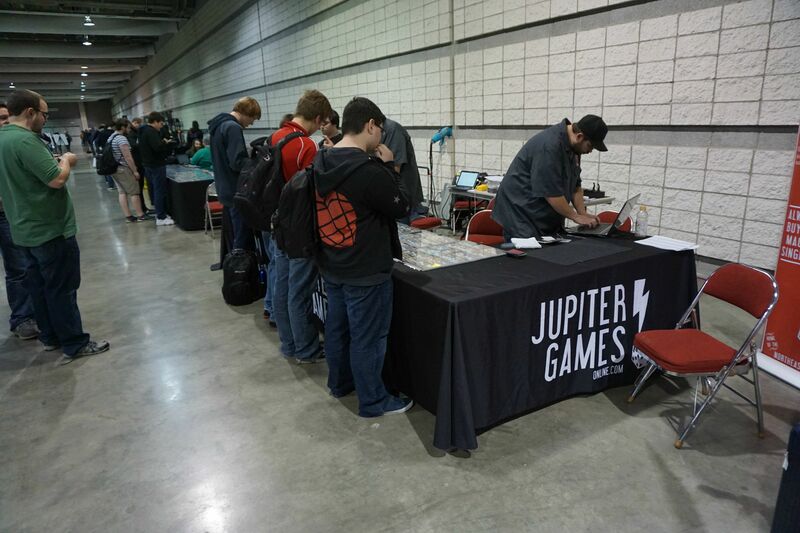 GP Pittsburgh was a great event to go to if you were looking to grind the tables and buy some cards. With prices in their seasonal decline, many opportunistic players were there looking to acquire underpriced staples and discounted deals. I myself did not play sanctioned magic at all during the weekend, and I’m sure that the other price writers present will be covering what happened with the TO and the GP as a whole. I can say that because the venue was packed, many grinders had extremely good weekends and I was lucky enough to partake in the spoils. After feedback on my twitter account from these articles, I also will be grading the vendors just like school. Let’s get into the plethora of vendors! 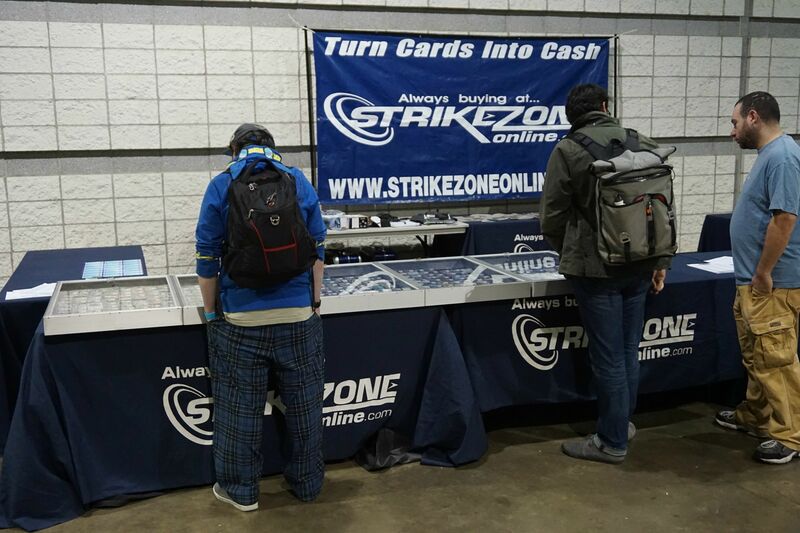 StrikeZone seemed to barely be vending this weekend. They left early all three nights, and were one of the later vendors to be arriving on site during Sunday morning. I think they ran out of cash due to their proximity to the entry hall, and as a result didn’t have to grind the long hours that the vendors farther away from the action had to. Their buy prices weren’t the best, but there were enough people selling to them to make their booth worth it. The weirdest part about buylisting to StrikeZone was the fact that they make you organize the buy piles into set and alphabetical order, which is something few lazy Magic players do. They used to be one of the top vendors to sell to, but it seemed that their prices waned with the sun at this GP. I sat down with them as they perused through my binders, but said no to all of their offers confident that I could get more for my cards elsewhere this weekend. MTG Card Market was at the very end of one of the two rows of vendor tables. They seemed to get little traffic because of this, and their buy prices weren’t amazing. They did however grab quite a few quarters this weekend out of my ogre box, perhaps in an attempt to get cards in at all! Jameson was quite friendly to everyone who stopped by however, and quite a few Chicago locals were selling to them this weekend. 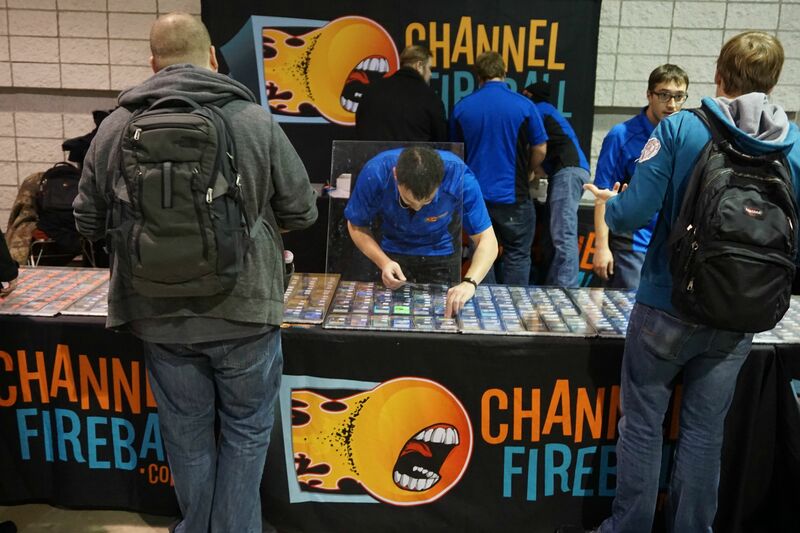 Channel Fireball had a booth about four booths down from the GP entrance. They were packed all weekend, and paying highly on miscellaneous cards. As a GP mainstay, many people were selling to them due to their brand loyalty and credit bonus. Their buyers were very friendly and I sold a couple hundred dollars of mid-priced cards to them. Taking credit, I was able to pick up some blue-chip modern staples such as Noble Hierarch and Thoughtseize that I’m confident will see nice returns next year. They also bought over 100 Snapcaster Mageand 100 Rhystic Study from individual buyers, which was pretty funny to see. Savage has vended the last couple GPs in a row. They always seem to attract a crowd, but didn’t have any stellar buy prices this weekend. They did, however, have low prices on played cards and had multiple Legacy staples at attractive buy prices all weekend. It seemed that they sold a lot of these to cube enthusiasts as quite a few happy people walked away with new cards. I didn’t sell anything to them or buy, but I always like to stop by and see what they have for sale. Gaming ETC had an interesting booth setup this weekend. 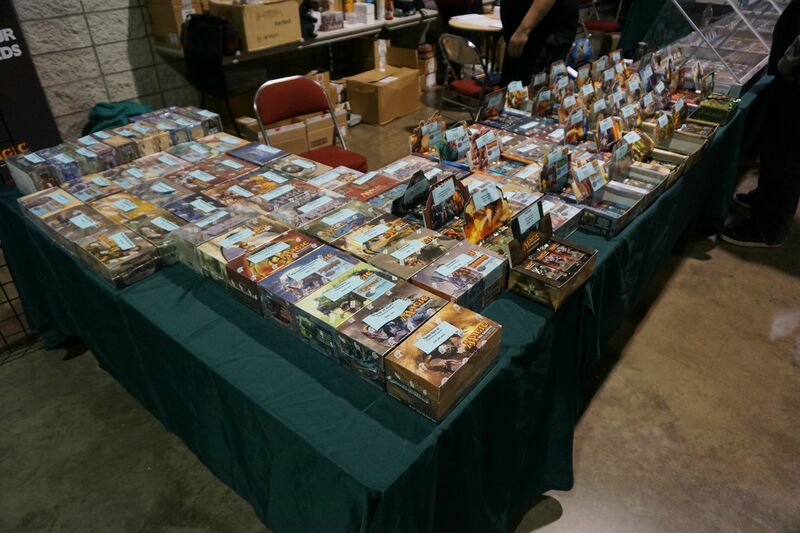 Half of their booth was covered in miscellaneous Magic products such as playmats and sleeves, compared to other vendors’ higher-margin items like packs and played binders. I wasn’t happy with their high sell prices and low buy prices, and the demeanor of their buyers didn’t make it seem like they were happy to be there. Jupiter seemed sparsely populated all weekend. They had both low buy prices and high sell prices. Their buyers seemed to be on their phones for most of the GP, and they only seemed animated during the busy Saturday morning. Next time, I don’t think I’m going to stop by Jupiter if this trend continues. Wizard Tower was one of the most interesting vendors this weekend. They had electronic boards that made seeing buy prices easy. 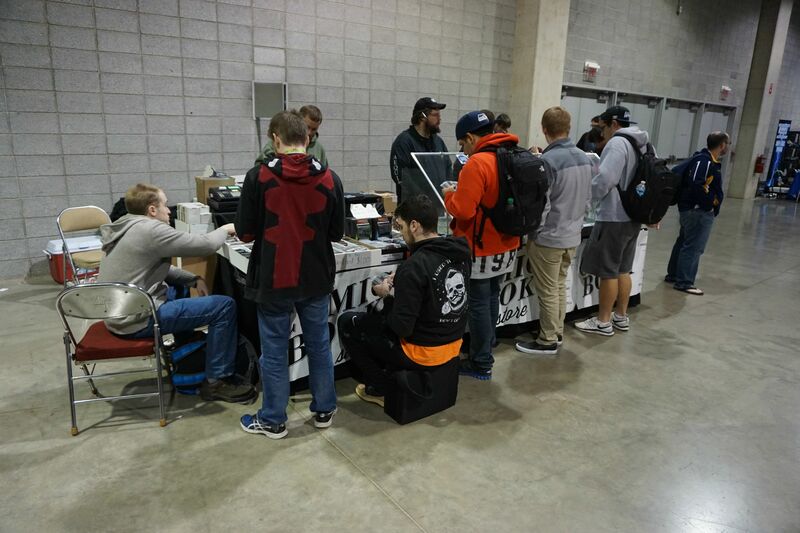 They also had some of the highest buy prices on casual cards this weekend, and had the line to show for it. The weirdest thing about their buying practice was that they manually looked up inventory numbers of each card that they were interested in buying. Selling to them took about twice as long as usual, which was fine for me as I wasn’t playing in the GP, but could be harder for those who were. They almost ran out of money on Saturday, as I was paid quite a bit of money in $5 dollar bills. However, their buying staff was top -notch and friendly. I’ve never seen them vend a GP before, but they will be one of the first stops I make if I see them at another. Phil was one of the nicest buyers I worked with all weekend, and made small talk with me while waiting for their inventory to load on his computers. Ice Imports is another vendor that has been showing up lately at many of the GPs. They had sell prices somewhere between TCGLow and TCGMid, which was pretty good for a booth. I wasn’t a fan of their buy prices, but they did have quite a few people selling them cards. Their buyers were asking people as they walked buy to sell them cards/ look at their shelves, which means they weren’t just sitting there during slow booth times. Busy times for booths happen between the breaks in each round when players are killing time, and slow times happen during the first 15 minutes of each round. Kirwan had a small booth in a corner of the room. It didn’t seem that they were buying many collections, but the people selling to them were selling giant collections that took quite a bit of time to buy in. I didn’t sell anything to them, but their hotlist was around 5% less than the top buylists in the room which wasn’t bad if you were looking to get credit for a specific card. MTG Deals has earned the reputation of one of the top vendors to stop by first at any GP. They definitely lived up to it as this GP. They had a pretty busy booth, and solid buy prices. I sold 10 Expeditions to them at barely below TCGLow, and their buyer Dave was friendly. He also offered a higher number on cards after I said no to the initial offer, which was a nice change of pace. At GPs you can always barter with vendors on high-end cards on the numbers you want, but it was nice to see him haggle with me on $20-$50 cards. I would recommend stopping by MTGDeals as one of the first booths at any GP. Coolstuff Inc also had a ton of traffic this weekend. I bought quite a few $16 original Modern Masters packs from them. Although the EV of the packs was great, my pulls weren’t. I sold them quite a few cards that they were paying extremely highly on, such as Modern Masters Slaughter Pact at $7. Their buyers were friendly, and I was satisfied with some of their cards in their played/ foreign binders such as a japanese copy of All is Dust at $4. Being one of the booths directly next to the doors of the room, RIW was quite busy this weekend. They had cards at retail prices, but had a ton of people buying from them. Customer service was exemplary with Marcel doing his best to accommodate weird card requests and talking about the history of the shop with people. They brought all of their sealed product and product damaged from their fire that had happened a couple months ago in a discounted binder. The cards didn’t smell smoky, but the prices were on fire in this binder. I picked up a promo Eternal Dragon for $5 in the binder, and one of my friends got a foil Sphinx’s Revelation for $10. I recommend stopping by RIW in the future if they still have this binder in the future, or to pick up packs for drafting with your friends. Brimstone brought the greatest amount of sealed product to the GP this weekend. Although their buy prices weren’t stellar, the selection of packs was quite insane. I bought a few original packs of Ravnica for fun at $20 each and pulled a Remand and an Overgrown Tomb. Their buyers were quite friendly with many people coming over to admire their sealed wares, asking how much they were, and then leaving after hearing the answer. For example, there was a sealed box of foreign Urza’s Saga on display. Many people incredulously walked away after hearing the number, but it didn’t seem that bad if you were in the market for something so rare. In the future if you want to see some unique stuff, I recommend stopping by Brimstone Games in the future. Face to Face was also situated near the doors of the venue, leading to a high amount of people stopping by. Their buyers were very friendly, but it seemed like the exchange rate of the Canadian dollar hampered their buying power this weekend compared to other vendors. They had prices around retail as well, but due to brand loyalty still had quite a bit of traffic. I was sad to say that their booth this weekend didn’t stand up to the pleasure of their game center in Canada. Had their buy prices been higher I would have sold them some stuff, but I was in the business of making the most money on my cards this weekend. These guys had solid traffic all weekend, with many locals stopping by to sell cards. I wasn’t a fan of most of their buy prices, but they were paying highly on Command Tower which meant that there must be a huge casual market for them. Their buyers were friendly, but I didn’t sell them many cards. Grade ( C ) Average. Aether has consistently been one of the first vendors I have stopped at at nearly every GP. This weekend was no different. They were paying $17 on Thoughtseize, $2 above the TCG Low at the time. I sold them quite a few Emrakul, the Aeons Torn at $19 and Leyline of Sanctity at $7. They were paying the highest in the room on the fetch land Expeditions, and also were paying $50 on the SCG Tasipurr playmats. They bought so many of these cards at their high buy prices that they dropped many of them after their quote was filled. One person singlehandedly sold them almost 200 Thoughtseizes. Their buyers were friendly, and very professional. I also bought quite a few cards from them this weekend. I bought them out of Japanese foil Plains at $5-6, depending on the art. With those prices barely above English, this is something that I expect to see better returns on then their English counterparts. I also bought quite a few Russian fetch lands since I like Russian more than English cards. Overall, I would recommend making Aether one of your first stops at any GP. You could barely tell that Troll and Toad had a presence this weekend. Whether it was their low buy prices or shipping practices, they had almost no traffic this weekend. They have also been known to not honor their online buy prices. Cards were haphazardly flung into their cases in different directions, and their buyers seemed quite moody as well. This is the exact opposite of what a vendor should be like at a GP, and I was extremely unimpressed. Grade (F) Worst Vendor at the GP. Empire had a good selection of high-end cards and sealed product this weekend. I sold them quite a few standard cards that were not tier 1 anymore. I also bought a few RTR packs for fun, but didn’t open anything worthwhile. If I see them at a GP in the future, I’ll probably stop by again but nothing they had blew me out of the water. The floor was extremely busy this weekend. With the venue packed to capacity, most of the grinders there Saturday sat by the last row on circular tables. Many people gave up value to get Expeditions at a loss, and as you’ve probably read by now Expeditions are finally rising from their floor. Trinisphere was virtually nonexistent in anyone’s binders, and had a strong demand from grinders even though no one had any. There were many established shops grinding inventory, with many getting rid of fetch lands for local goods as fetches have finally started to dip back down. I also helped a friend get a Black Lotus this weekend. He came up Saturday afternoon with a binder full of dual lands. I had already asked each vendor their buy price on duals, and had calculated the amount of credit/ cash he would receive in order to make it easier on him since he would only be at the GP in a couple hours. We ended up trading 24 mainly non-blue duals for a MP- Black Lotus that Aether had at 2300 in buylist. 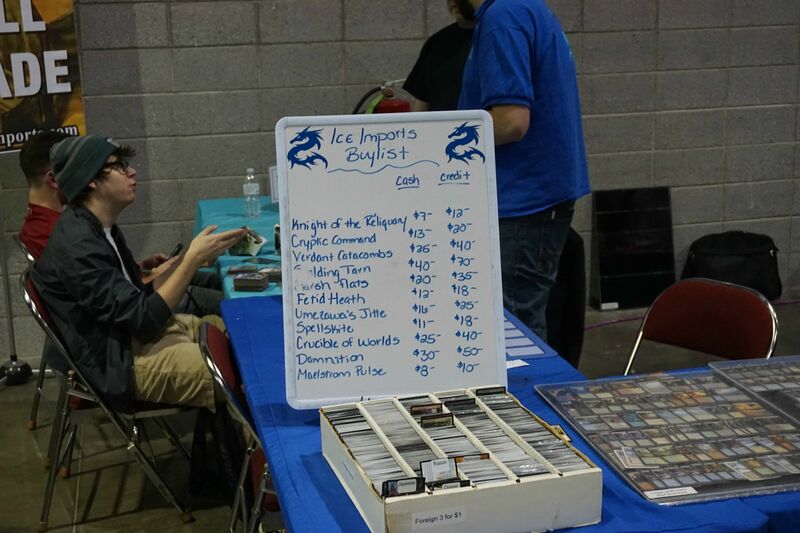 Aether was offering the highest in the room on dual lands this weekend, which was odd as I had heard that almost no vendors wanted duals the week before. Coolstuff also only wanted mint duals and had extremely low prices for even SP duals, something I think more vendors will be shifting to in the future. After four straight weeks of GPs, many vendors were also out of cash. Only Aether, Deals, and CFB had cash left towards the end of Sunday, meaning that desperate or lazy Magic players got the lowest amounts of cash offered and still took it. If you want to sell at a GP, make sure to sell before the GP even starts Saturday morning. Overall, GP Pittsburgh was a fun time from a financial perspective! With no GPs for the next six weeks, I expect card prices to drop more overall as people try to sell off inventory by the end of the year. Feel free to leave feedback in the comments, or reach out to me on twitter @LengthyXemit. GP Indy was a great time this weekend. With 11 vendors in the room, there were plenty of opportunities to get top dollar with so much competition for the bucks in your binder. I figured I’d share my opinion of GP Indy with you, so that you guys can come to recognize the GP scene more. As a disclaimer once again, I’m not a writer, only a finance guy who wanted to express my opinion. For this GP, I decided to ogre a few cards in my collection. Ogreing is named after a well-known vendor called Ogre, who is present at pretty much every GP. It’s pretty simple. You get a two or four-row and fill it with cards by price that you want to get on each card. Using top loaders or sticky notes, write how much you want for each card and have each vendor pull out the cards if they’re okay paying the price of the card in your column. It saves the vendors a ton of time, and allows you to get top buylist for each card. Let’s get in to the 11 vendors and what each of them brought to the GP! 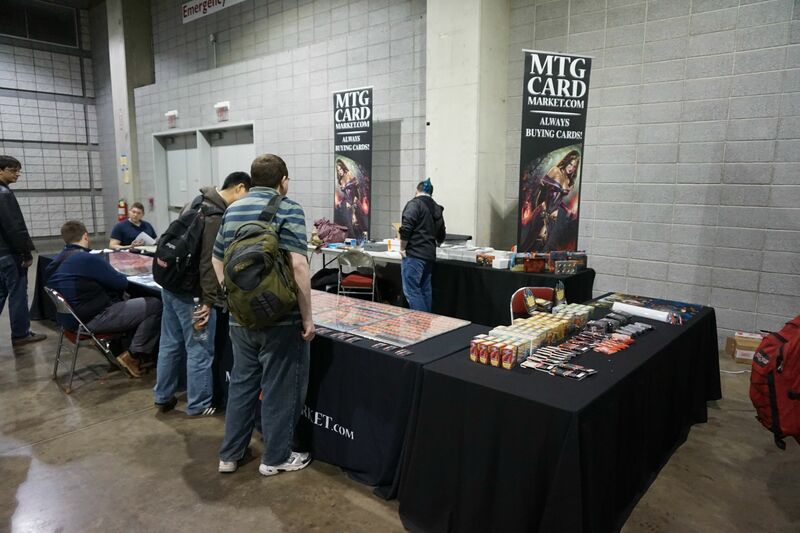 MTG Deals attended their first Midwest GP in quite a while. They came strong out of the gate with a buy price of $30 on Gideon and $57 on Jace, Vyrn Prodigy, as well as a strong buylist price of $5 on Anafenza and $4 on Oblivion Sower. With Sower appearing to be a failed buy for now, it was a good weekend to dump copies at a break-even point. I didn’t sell anything to MTGDeals, but I did buy a few cards from them. Like most vendors, they had a played section case for deals that appealed to players of all stripes. I found a warped reliquary tower promo for $1 which I kept for personal use, and a beat up Thoughtseize for 13 that I traded for a monastery mentor. I hope to see them in the future for more sweet deals in their played case, and hopefully next time I will have cards to sell them on their hotlist. Tales had a strong buying crew this weekend. Adam; normally a floor grinder for Ogre was buying for them in his usual tophat. They seemed eager to buy cards, and were definitely asking every person walking by if they could see their binders. I also didn’t sell any cards to them, but Adam’s power of persuasion incited my need to spend a couple dollars on a playset of Splinter Twin. Their other buyers were also friendly, and they definitely had a line on Friday of people waiting to sell cards. With bulk buy prices of 11 cents per rare and $4 per thousand on bulk C/U, many people were outing bulk to them throughout the weekend. Hotsauce was an interesting experience to say the least. 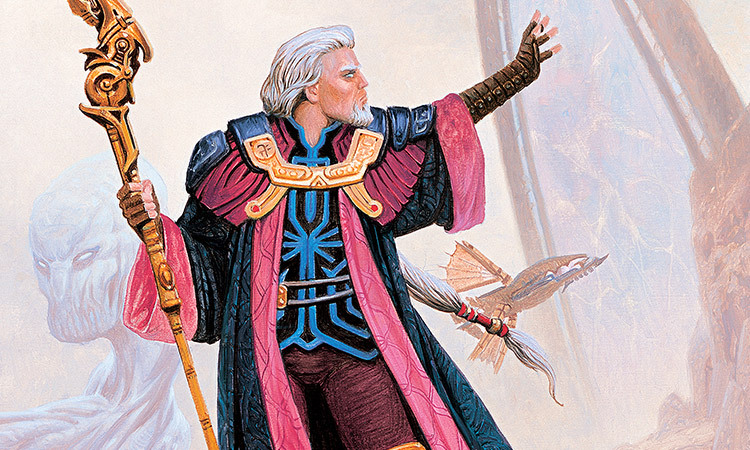 Although it didn’t seem like they had stellar buy prices outside of Ulamog at $12, they definitely had enough people selling to them to make it a profitable venture. Aaron Werst, a bubbly shop owner from Indiana, was in attendance with quite a few people stopping by to see how he was doing and sell him some stuff. Joe Bernal, a well-known grinder when he’s playing, was buying for them this weekend as well. I didn’t get the numbers I wanted on cards I showed them, but their deals sure were hot. I picked up a played Tropical Island for $90, a foil Time Spiral Vesuva for $15, and a played Volcanic Island for $175. I sold the Vesuva to Coolstuff for a dollar more, and expect to get a premium in trade in the future for the dual lands. I highly recommend stopping by this booth in the future to buy some cheap cards out of their case. 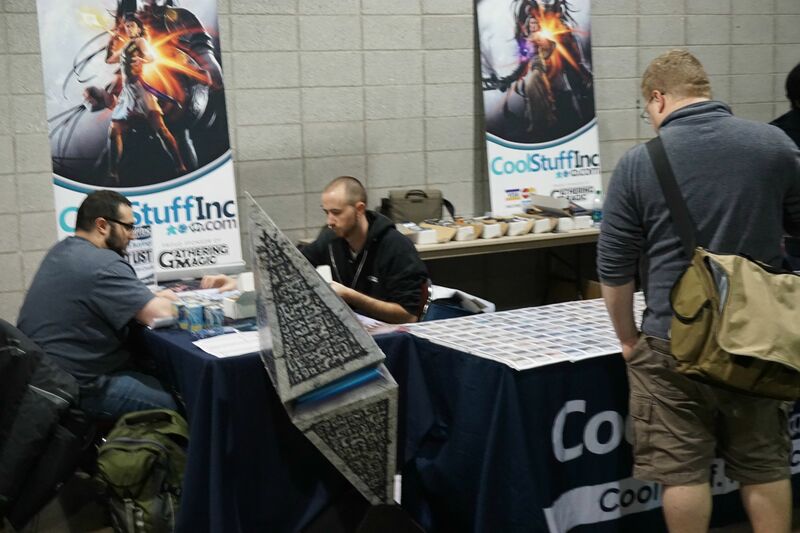 Coolstuff has always been known as a great booth to sell and buy casual cards from. They definitely lived up to my expectations this weekend. After picking through my ogre box, they pulled out about 20% of my cards. Getting $1 on Wild Slashes, Chaos Warps, and Jet Medallions sure added up fast. I was able to trade in for a LP Mana Drain with their store credit bonus of 25%. I also got about $150 in cash from them for the other cards that I sold them. 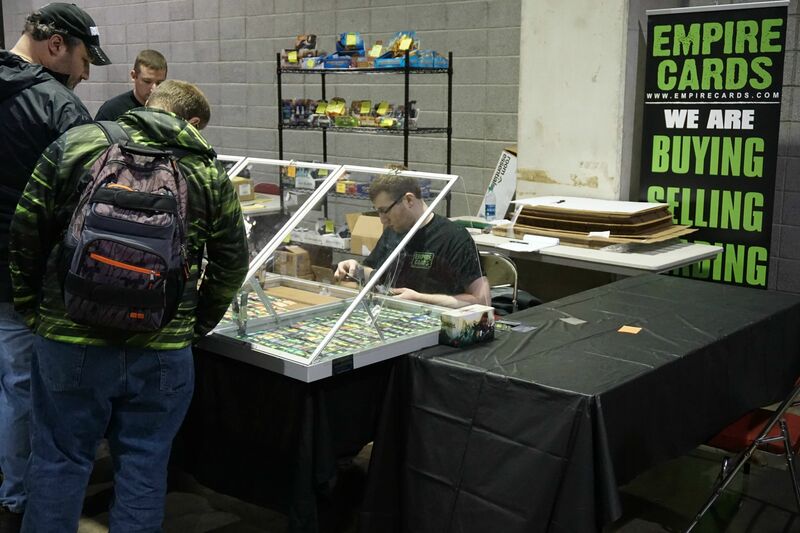 They didn’t have the cheapest prices in the room as far as selling cards went, but they were definitely paying high numbers on random cards throughout the weekend. Their buyers are also some of my favorite people to work with, as they know how to chat with the players instead of grumpily offering numbers on cards with a dour face. Pink Bunny has always been an interesting case for both me and other sellers in the room. Their online reviews are quite bad, and I have always stayed away from their booth due to past experiences of them cancelling my orders. In my opinion, they seemed to have turned over a new leaf at this GP. Their head buyer Damien was extremely charismatic this weekend, and after a lengthy discussion about buying tips convinced me to sell him some cards. Their prices on them were fair , and they matched a couple of top buylists in my ogre box on cards that they were confident they could move. I hope to see a repeat performance from them in the future, and cautiously advise you guys to stop by and see their prices at the next GP. Aether came out swinging this weekend. Not only were they offering insane prices on competitive cards, they also were vending two GPs simultaneously on two different continents, splitting up their buying talent. After trading a Mox sapphire for Tasigurs and Eidolons at Buylist last weekend, I was really happy to make a profit selling those cards to Aether. They took over a hundred Tasigurs and 40 Eidolons from me, as well as many Constructed staples such as a complete set of 40 shock lands and over 20 fetch lands. Aether is still my go-to place to sell competitive cards, as I’m not sure that anyone can beat buy prices above TCGLow. It could have been possible to crack BFZ Event Decks and almost get 40 free cards after selling them Hangarbacks, Tasigurs, and Whisperwood Elementals. I sat down with Keith multiple times, and he was quick and professional when buying from me. They also had pretty good deals on Expeditions, such as Temple Gardens at 45 that seemed to disappear whenever I turned to look at another case. Aether has been my first stop when the doors open at every GP for the last couple of months, and I see no reason to go to another vendor first. However, it also has become well known that they are not interested in casual cards in the slightest, so I don’t advise selling any EDH cards to them unless you want to hear lower numbers than normal. Pastimes looked through my ogre box and pulled out around 50 copies of Roast and Silkwrap that they bought for $1 each. I was pretty happy with the profits, but not happy with the mood of their buyers. They didn’t seem happy to be there, and should have greeted each potential seller with a smile on their face. I haven’t really sold much to Pastimes in the past, and honestly I haven’t seen a reason to do business with pastimes at almost any GP. They haven’t paid higher than any other vendor in the room for a while, and it seems to be locals that like to sell to them to support their shop. I haven’t seen MTGFirst at a GP for quite a while. They didn’t seem to have great buy prices or sell prices. However, they had a shelf entirely full of alters which looked really amazing. The prices weren’t that much more expensive than the normal cards, but I wasn’t in the market for alters at this GP. If you see them in the future, I recommend stopping by to see what they have in stock alter-wise, but they seemed tepid at best for selling to based on their hotlist and the amount of people selling this weekend. Q&A Magic debuted for their first time this weekend. AJ from Gray Ogre decided to open his own booth, and he had Ogre working the booth for him this weekend as well. As always, when Ogre is working at any booth, you need to stop by. 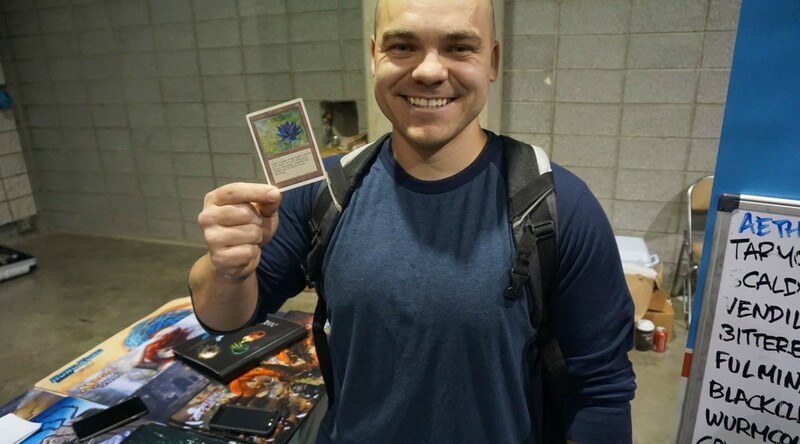 I’m not sure what it is about Ogre besides his smile, but he could charge $20 to talk with him at GPs and people would line up to say hi. Due to Ogre working at Q&A , they had a considerable amount of traffic this weekend. 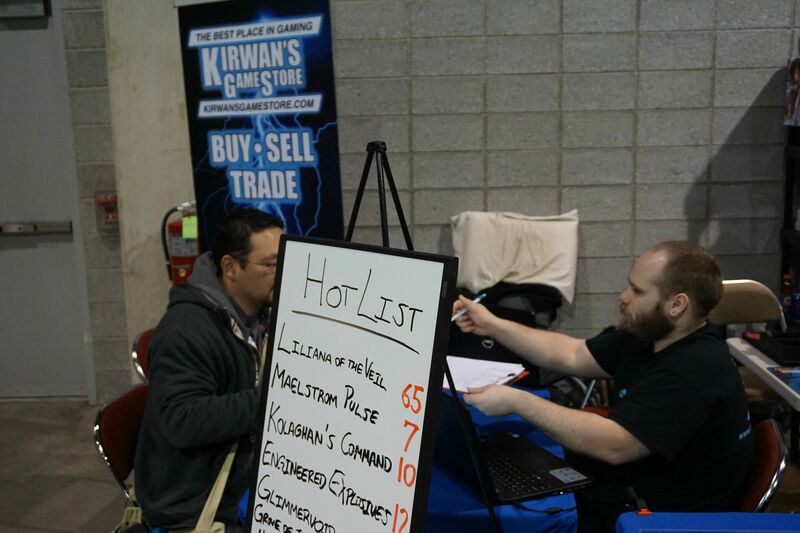 In order to stay competitive, they raised buy prices on their hotlist to match other vendors this weekend. They seemed determined to make a name for themselves on the circuit, and this GP was a great start to it. Ogre picked through my Ogre box and didn’t find anything, but he did find a small amount of cards in my binders that he paid handsomely on. However, they also weren’t without their faults. AJ had the persona of a brick wall when dealing with many people this weekend. Although I was happy with my experience, quite a few of you reached out to me on Twitter about how you were treated at his booth. I also wasn’t happy with his practice of pulling out cards and putting them on the mat, and then downgrading them for condition right before adding cards up. Hopefully this practice will cease soon, as it made me feel uncomfortable seeing my $9 sell price on Sacred Foundry go down to $7 right before I was handed cash. As a newcomer to the scene, I still recommend stopping by Q&A magic in the future to see some of their deals and buy prices. 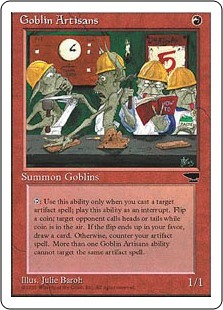 They also were willing to negotiate on cash buys for random foils such as cascade bluffs and shizo, death’s storehouse. Being flexible might not make the best margins for them, but it sure made me a happy customer! 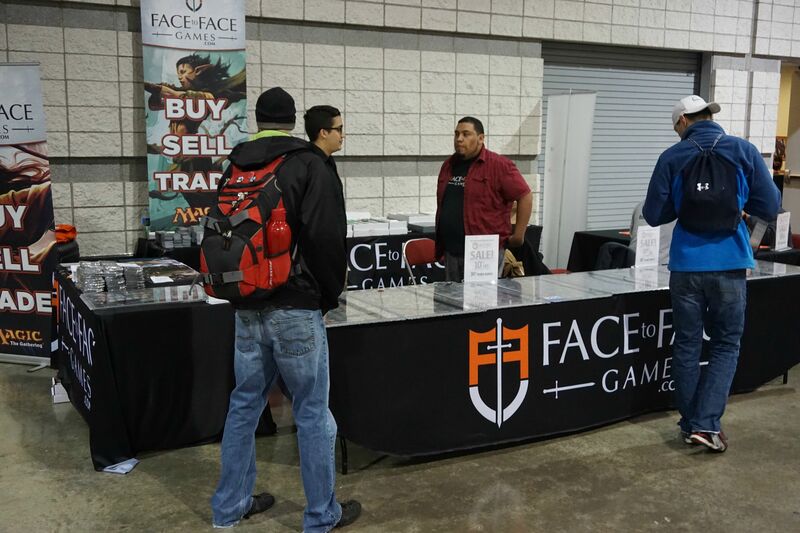 Alter Reality Games didn’t bring much to the table this weekend, besides overpriced Modern Masters packs compared to the rest of the vendors at $12. I was quoted about 20% lower prices than top vendors like Coolstuff and MTGDeals. I also wasn’t happy with the mood of their buyers. They didn’t seem to interact with any of the sellers sitting next to me, and didn’t attempt to make conversation or friendly banter with anyone. The mood of a buyer is important to me, as I want to feel happy sitting down across from you while selling cards instead of listening to grunted numbers. After a negative experience as well at SCGSTL, I’m going to stay away from these guys for a while. Once again, this is just a personal view of mine. If you had a different experience, feel free to leave comments or reach me on twitter @lengthyxemit. Dave and Adams brought the most high-end inventory by far with hundreds of graded pieces of Power. They picked through the rest of my Ogre box and took the dregs, as well as a couple commander and Khans cards. I struck up a conversation with the head buyer, and chatted for a bit while he bought cards from me. I’m sorry that I can’t remember his name, but it was definitely one of the top experiences buylisting this weekend besides Aether and Coolstuff. Even if someone is only buying $200 of cards from you, he should be able to talk about bad beats stories with old cards as well as how D&A runs their operations with one of the largest gaming spaces in the United States. I gained a lot of insight about the price of Pokemon bulk as well ($40 per k minimum is insane!) and walked away happier with some cash and their business card in my pocket. Even though they didn’t have the highest buy prices in the room, the experience of buylisting to them will definitely make me a repeat customer. They also had sealed high end product such as Collector’s Edition, Legends, and a Revised box that were cool to look at though a bit out of my price range. Disclaimer: This weekend was Halloween and RPTQ weekend, which may have led to the numbers below. However, it should also be noted that there was a RPTQ on site Friday afternoon. So as many of you read from my tweets, pastimes TO’d an interesting GP this weekend. Pastimes rented one event hall for Friday, two for Saturday, and one for Sunday in order to accommodate all of the players for the GP. The thing is, they didn’t even need the second hall Saturday because not enough people showed up! A $70 fee to enter a GP is approaching ludicrous territory. Pastimes seems to have overestimated the amount of people willing to pay $70 and have $700 tier one decks. On top of that, myself and a couple friends attempted to enter a Legacy Win-a-Box and ran into trouble. They were asking $20, more than twice the cost of a box for them since they rake in $160 per event. After looking online, it said that their Legacy Win-a-Box was $15. We showed it to them, and they still insisted that it was $20, as well as the Legacy side event also being $20. After being frustrated, we decided to not spend another dollar at Pastimes that weekend and instead play casual Legacy in a corner of the room. I honestly will most likely not attend another Pastimes GP for quite a while after this weekend. After attending both GP Chicago and GP Indy, it’s time to ask for a better TO in the Midwest than Pastimes. The low attendance also had an effect on the vendors. Friday was very good for all of them, but after Round 2 of Saturday, there were very few people selling to any of the vendors for the rest of the weekend as some of my pictures show even in between rounds when people are normally selling. 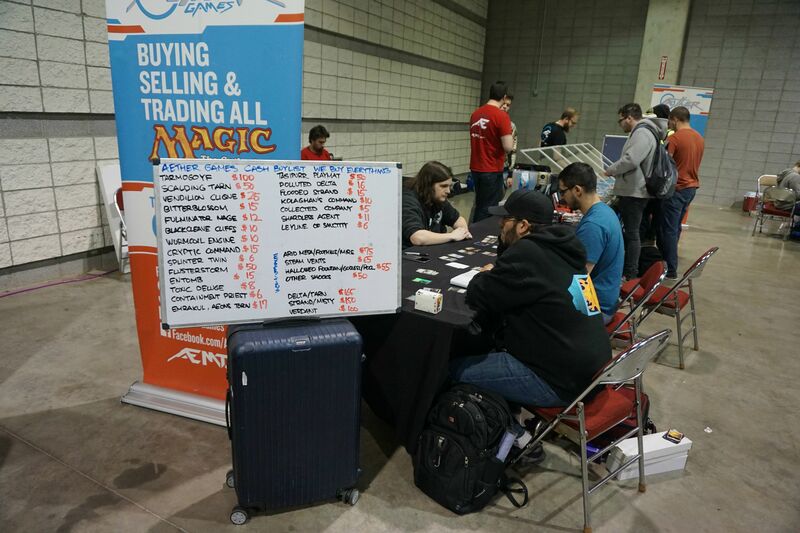 I think most of the vendors made an okay amount of money, but due to the lackluster attendance were not able to get enough cards in to make the Grand Prix as profitable as any others this month. Fetchland buy prices had also stabilized across all of the vendors, plateauing at $20 on Polluted Deltas instead of being higher like other GPs this month. Bloodstained Mire was the most sought after fetch this weekend for some reason, and at least four of the vendors had none in stock by the beginning of the GP. As of the time of writing the article, I’m still not sure where the meta is that prompted the high demand for Bloodstained Mires this weekend. Anyways, thanks for reading. Once again these are my opinions, and I’d love feedback on your experiences at GP Indy. Until the Next One! 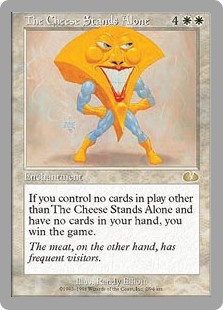 Question: Biggest Trap in MTGFinance? Condition of Cards . On older cards, SP to MP Prices vary a lot and can be the difference between a $3,000 Black Lotus and a $5,000 Lotus – Ogre. Foils newer than Zendikar for eternal staples. There’s just too many and they’re printing for millions of players – Floor Grinder. What’s one thing Sellers should know before sitting across from a buyer? Having a binder of bulk rares with a couple $4 dollar cards in it. It wastes both of our time –Aether Buyer. Unorganized Binders – Tales of Adventure Buyer. We’re trying to make a living. Understand that we do need to make a profit on these cards, and sometimes can’t afford to pay high on certain cards because they don’t move well for us. –Anonymous Store Owner.